Kathleen Hebdon, RN has earned a master’s degree in diabetes nursing from Capella University, which furthers her clinical education in the field of diabetes. Hebdon is a certified diabetes educator who leads the hospital’s efforts to teach patients and community members about pre-diabetes, diabetes, and managing this chronic condition. Diabetes is the fifth leading cause of death & disability in the United States. Type 2 diabetes is an avoidable condition. Bertrand Chaffee Hospital is coordinating a Prevent Type 2 Diabetes (PT2) program, facilitated by a certified diabetes educator and a registered nurse, both whom are certified prediabetes lifestyle coaches. Studies indicate that graduates who successfully complete the one-year education and support program can prevent or delay the risk for developing type 2 diabetes by up to 58%. Who should consider this program? The CDC estimates that over 33% of adults have prediabetes. Persons with a diagnosis of prediabetes, impaired fasting blood glucose, have a history of gestational diabetes, have are overweight (have a BMI greater than 24) are at risk for type 2 diabetes, or score of 9 or more on the prediabetes screening test [https://www.cdc.gov/diabetes/prevention/pdf/prediabetestest.pdf]. How can I register? Call (716) 592-9643. We are currently taking registration for a Thursday class to start July 5th at 1 p.m. The first six months, participants meet weekly and after that, monthly meetings will help keep you on track. Additional classes will be scheduled to meet patient demand. If you cannot attend on Thursday afternoon, call and we will inquire of the best day and time for future classes. Details and Cost: The PT2 program is covered by many insurances without a co-pay and always by Medicare. When calling to register, additional information on insurance coverage will be available. Classes will be offered on different days and times when at least five persons are able to start a new class. Peer-support is an important part of the success of this program, so patients are unable to jump into classes that already exist. November 14 is World Diabetes Day, an occasion to raise awareness of diabetes around the globe. How can you mark the day? Make a plan to wear gray! Employees at Bertrand Chaffee Hospital and the Jennie B. Richmond Nursing Home will be participating and we’ll be taking pictures from around the facility on that day. 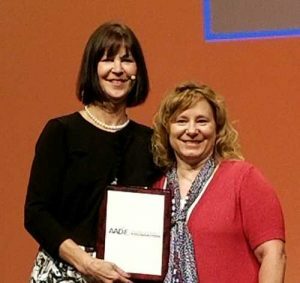 Springville resident Kathleen Hebdon, RN received one of two “Rising Star” Awards from the American Association of Diabetes Educators (AADE) at its August meeting. She was recognized as a diabetes educator who has demonstrated leadership and commitment in her practice. Hebdon leads the diabetes education efforts at Bertrand Chaffee Hospital, which has a program that is accredited by the AADE. 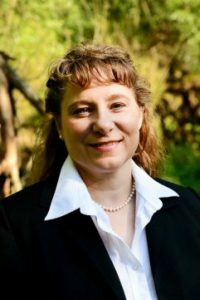 She became a certified diabetes educator, and established an AADE chapter in Buffalo, the fourth chapter in New York State and the only one west of Albany. Hebdon was also named a president-elect of the New York State AADE board of directors. Her four-year term will begin in 2018. There are more than 800 diabetes educators in the NYS AADE organization. The mission of AADE is to empower diabetes educators to expand the horizons of innovative education, management and support to provide optimal health and quality of life for persons with, affected by or at risk for diabetes and chronic conditions. Kathleen Hebdon, RN and Nancy D’Hondt, RPh, President of the American Association of Diabetes Educators. Cook celery and onion in a large skillet w/margarine until tender, but not brown. Stir in chopped apple, allspice and cardamom. Cook uncovered for 10 minutes or until apple is tender, stirring occasionally. Transfer mixture to a large bowl. Add bread cubes to mix. Toss gently to coat bread, but don’t overmix. Set aside. Untie Roast and separate in halves. Trim excess fat. Spoon about ½ apple stuffing mix over half the meat. Re-assemble roast. Tie with string to secure. Place on a wire rack in a large roasting pan. Sprinkle roast with salt, pepper and garlic powder. Roast stuffed meat uncovered in the preheated oven for 2 ¼ to 2 ¾ hours or until meat thermometer registers 160-170˚F. Combine raspberries, currant jelly, apricot nectar and sugar in a medium sauce pan. Cook and stir over medium heat until mixture just comes to a boil. Strain through a sieve. In the same sauce pan combine cornstarch and water. Stir in raspberry mixture. Cook and stir until thickened and bubbly. Cook and stir 2 minutes more. Nutrition facts per serving: 165 calories, 6 gm fat, 91 mg sodium, 12 gram Carbohydrate, 14 gram Protein. In a large sauce pan over medium heat, heat the oil. Add shallots and garlic and cook, stirring until softened, about 3 minutes. Add the stock, salt and red pepper; bring to a boil. Reduce the heat and simmer, covered until the rice mixture is almost tender, about 30-40 minutes, but still chewy. Add orange zest and parsley; toss lightly. Combine the vegetables, olive oil, rosemary, garlic, salt/pepper to taste in a large bowl. Toss by hand to coat vegetables. Spread the mixture evenly onto baking sheets. In 450˚F oven, bake vegetables for 15 minutes. After 15 minutes, stir vegetables and return to oven. Bake an additional 15 minutes or until vegetables are tender and brown. Nutrition Facts per ½ cup: 83 calories, 0.4 gm Fat, 42 mg Na, 15 gm Carbohydrate, 2 gm Protein. Line mini-muffin cups with paper liners. Break gingersnaps into pieces; process in food processor to make about ½ cup fine crumbs. Place 1 tsp crumbs in each paper liner. Beat cream cheese in medium bowl with electric mixer at low speed until smooth. Add pudding mixes and milk. Beat at high speed 2 minutes or until smooth and creamy. Spoon 1 ½ Tbsp. cream cheese mixture into each paper liner. Place bites in refrigerator to chill until served. 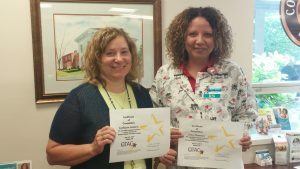 Kathleen Hebdon, RN and Sheri Plummer, RN of the Bertrand Chaffee Hospital Diabetes Education team have completed the Diabetes Prevention Program (DPP) Lifestyle Coach certification. This complements the Diabetes Self-Management accreditation that the hospital has achieved, and will result in additional services that can be offered to patients and covered by most insurance plans. Studies have shown that patients who attend weekly sessions in diabetes programs for an extended period of time have been rates of prevention because of the healthy lifestyle habits they develop. After an initial 16 weeks, patients are encouraged to attend a monthly support group. Those who commit to attendance up to a full year have the lowest rates of converting to a diabetes diagnosis. For information about upcoming Diabetes Education programs, call (716) 592-9643.